With the Gaza-Israel conflict regularly rearing its deadly head and with Israel’s military having an obvious advantage over the Palestinians , a brief look at how Israel views its neighbours will provide us with a better understanding of the conflict. Each of the two sides in the Palestine – Israel conflict has its own narrative which is used to justify the actions that it takes. 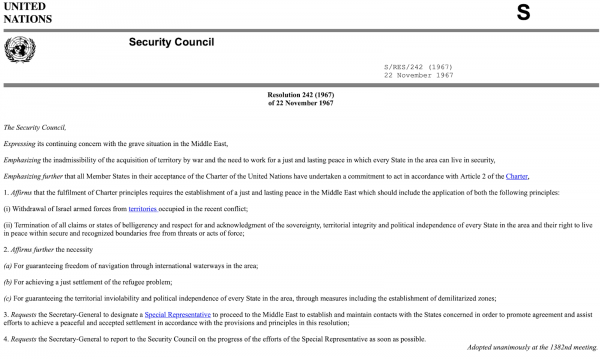 In the case of Israel, they claim the constant threats to their civilians, their historical attachment to the land that goes back to Biblical times and the promise of God, the 1948 partition plan implemented by the United Nation and the necessity of having a homeland which will protect them from a repetition of the Second World War holocaust. Palestinians focus on their unceremonious removal from the lands that they held for hundreds of years, their continued subjugation at the hands of Israel, the restrictions on trade that have punished their economy and the military imbalance that results in the deaths of far more Palestinians than Israelis. As well, both sides downgrade the suffering of the other side; the Israelis rationalize their occupation of their Promised Land by minimizing the impact of their condescension toward Palestinians who are treated much like Jews were treated by Germans during the Second World War and the Palestinians rationalize their refusal to accept opportunities for a peaceful solution and their rabidly anti-Israel leadership. 1.) Support for a two-state solution: support stands at 46 percent among both Palestinians and Israeli Jews. This is down from 51 percent of Palestinians and 58.5 percent of Israelis in 2016. Among Israeli Arabs, support stands at 83 percent. 2.) 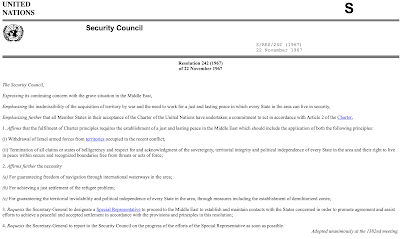 Support for a permanent peace agreement package: The peace package includes a de-militarized Palestinian state, an Israeli withdrawal to the Green Line with equal territorial exchange, family unification in Israel of 100,000 Palestinian refugees, West Jerusalem as the capital of Israel and East Jerusalem as the capital of Israel, the Temple Mount under Palestinian sovereignty and the Jewish Quarter and Western wall under Israeli control. Support for this package stands at 40 percent for Palestinians and 35 percent of Israeli Jews. This compares to 39 percent of Palestinians and 46 percent of Israeli Jews in 2016. Among Israeli Arabs, support stands at 85 percent. Interestingly, only 23 percent of Israeli Jews support the concept of a split Jerusalem as a capital city and 66 percent oppose the arrangements for splitting the Old City of Jerusalem. 3.) Viability of a two-state solution in light of the Israeli settlements: 42 percent of Israelis and 60 percent of Palestinians believe that settlements have spread too much for the two-state solution to be viable. 4.) Expectations of the establishment of a Palestinian state in the next five years: 75 percent of Palestinians and 73 percent of Israeli Jews do not believe that a Palestinian state will be established in the next five years. 5.) Armed struggle: 38 percent (up from 20 percent in 2017) of Palestinians opt to wage an armed struggle against Israeli occupation and 18 percent (up from 12 percent in 2017) of Israeli Jews called for a definitive war with the Palestinians. 6.) 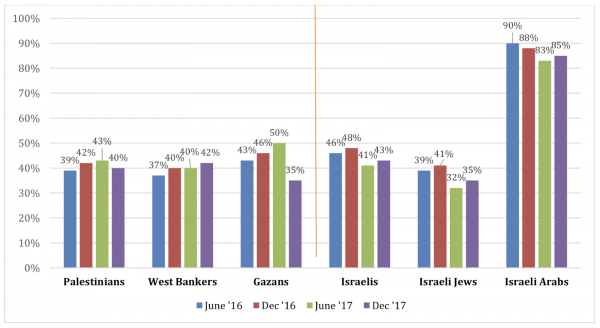 Fear toward the other side: 46 percent of Palestinians fear Israeli soldiers and armed settlers compared to 57 percent of Israeli Jews who fear Palestinians. 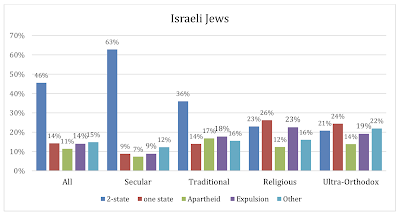 Among Jewish settlers, 79 percent feel fear towards Palestinians. 7.) General conditions in the Palestinian Territories: 69 percent of Gaza Palestinians and 72 percent of West Bank Palestinians describe conditions in their respective home territories as bad or very bad with a significant increase from 46 percent in June 2017 for Palestinians living in the West Bank. Among Israeli Jews, 46 percent describe conditions as good or very good. As we can see from this posting, there is a significant worsening of the attitudes of both Israeli Jews and Palestinians towards each other and the prospect of a lasting and peaceful solution to a war that took place prior to the lives of many Israelis and Palestinians. While every American administration since 1948 has proclaimed that it has the ultimate solution to the Middle East brouhaha, it is pretty clear that, unless there is a significant change in the mindset of both Israeli Jews and Palestinians, there is no hope for a peaceful resolution of a five decade-long crisis.